Speyside distillery Glen Moray has introduced a new range to the travel retail channel, including a no-age-statement, 12-year-old and 15-year-old Scotch whisky. The range – called Elgin Signature – is said to “give an excellent overview of the whiskies produced at the Glen Moray distillery in Elgin”. The no-age-statement bottling, called Elgin Signature Classic, has been matured in first-fill American oak casks and is targeted towards single malt novices. Elgin Signature 12 Year Old is a higher abv iteration of Glen Moray’s signature expression. It has been aged in ex-Bourbon casks and offers a “more intense taste experience”. Elgin Signature 15 Year Old has been aged in a combination of oloroso Sherry casks and American oak, giving it a “rich and full-bodied” character. All three expressions have been bottled at 48% abv and are non-chill-filtered. 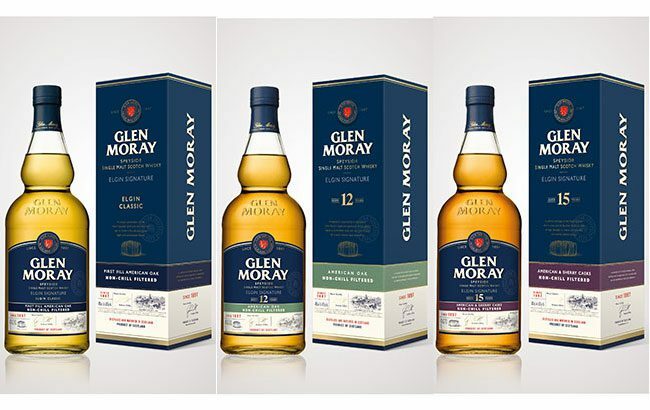 “This new collection is steeped in the age-old traditions we hold dear,” said Glen Moray brand manager Raphaele Delerue. “It literally goes from barrel to bottle – meaning we can offer a higher proof product. “Sampling all three of the Elgin Signature collection is, we believe, an experience that’s as close to stepping through the doors of our Elgin distillery as you can get. Glen Moray has also added a new expression to its Classic Collection in the domestic market – Glen Moray Cabernet Sauvignon Cask Finish, which after its maturation in ex-Bourbon barrels is transferred to red wine casks for a number of months. Master distiller Graham Coull said: “We’re delighted to see the Glen Moray Classic Collection going from strength to strength with this exciting new addition to the family.